Welcome! Come in and visit for a while. Indiana Ties is a place for sharing family history. I hope you enjoy the family history developments that are constantly on-the-move at Indiana Ties. There are various family history stories and research happenings sprinkled throughout this site. Finding the ancestors who have passed on is fun; but I am equally as happy when I hear from walking, talking cousins. It's my goal to share our history with all who are interested. So, please browse through the pages on the above tabs. You'll find family lists, stories, newsletters, photos and more. Check out the ongoing dialogue and special features at the Indiana Ties blog. The families on these pages are from Baden, Bavaria, Hessen, Prussia, Pomerania, and destinations in the United States, such as Maryland and Ohio. Of course, tbere may be some locations yet to be confirmed. The immigrants from all of these European countries mentioned eventually made there way to Indiana. Thus, I have chosen to call this website for gathering them all together Indiana Ties. A partial list of surnames I'm researching is below. If you believe we may have a family tie, or just have a question, let's talk about it. Send an email using the Contact Me form on the right below. 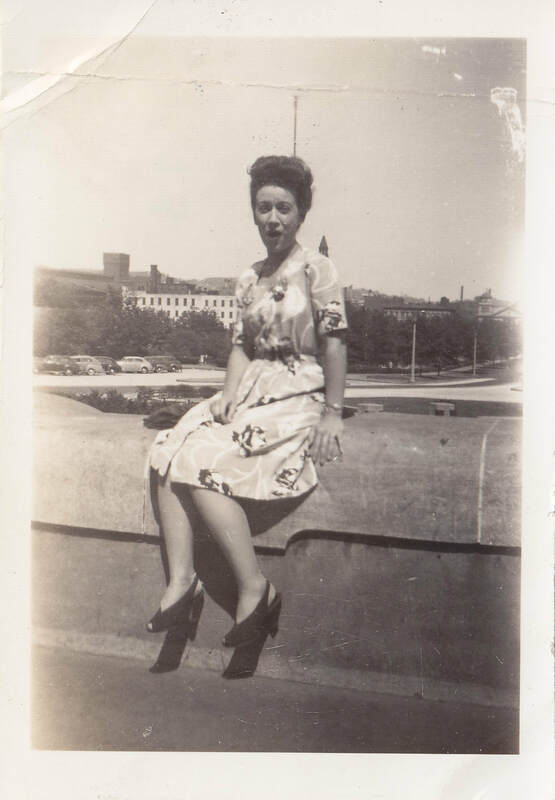 Peg (Weber) Stull, my aunt and my mom's sister, traveled to various states to follow her husband, Jim, while he received training in the U. S. Army. In this photo she was in California. Peg worked as a seamstress while Jim was learning to be a soldier, preparing to go to Europe to fight in World War II. They reunited when he returned and raised a family in Indianapolis. Peg recently passed away at the age of 94. She was a vibrant, intelligent, independent and loving lady all of her life.